Charity • Donation clearinghouse helps corporate cast-offs find new homes. Scott Sommerdorf | The Salt Lake Tribune Service Experts employees (from left to right), Sean Straatsma, Ken Best - area Operations manager, and Kevin Perkins - branch manager pose with a small representation of some of the clothing with outdated logs they will be donating to Good360, Service Experts, which does heating and air conditioning in Canada and the U.S. They changed their logo and have excess uniforms - including hoodies and coats - to get rid of. The perfectly good clothing is being donated to Good360. The Midvale office for Service Experts is amassing the clothing for this region and will ship it off some time next week.Good360, Friday, December 30, 2011. Corporations and Fortune 500 companies unload their excess items and Good360 helps them get to people in need who can use them. 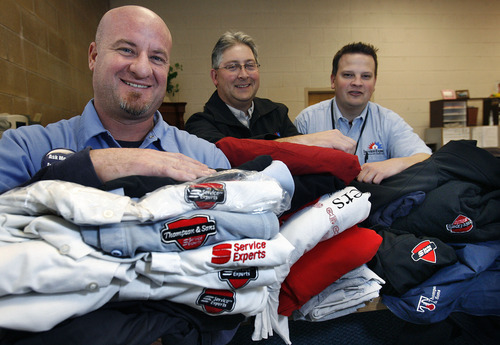 A change in logo meant that uniforms worn by heating and air conditioning technicians working for any of Service Experts's 110 offices nationwide and in Canada had suddenly become obsolete. But rather than discarding the clothing in Dumpsters and landfills, the company contacted Good360, an online donation clearinghouse based in Alexandria, Va., that will help collect like-new items and distribute them to those in need. Close to 1,500 items  including men's and women's work shirts, polo shirts, hoodies, jackets, knit caps, sweatshirts and pants  have been gathered from all over the country, said Service Experts spokeswoman Karla Neely. "The western region was number one in terms of contributions," Neely said, noting that $11,000 of the total $45,000 in clothing donations came from Arizona, California, Colorado, Idaho, South Dakota and Utah. In the past, each Service Experts office had its own "legacy" name, said Kevin Perkins, manager of the branch in Midvale that was formerly called Thompson and Sons. "This year we gave up our legacy names so that there is only one brand," Perkins said, adding that "we had a lot of good clothes and didn't want them to go to waste." The Midvale office, one of three in Utah, is gathering donations for several branches, Perkins added, and plans to ship them next week to a hub where Good360 can pick them up. "We found Good360 through the Internet and interviewed them to see if they could work with our logistics," Neely said. "The experience so far has been excellent." Good360 launched its product philanthropy venture in 1983 under the name Gifts In Kind. According to its website, in its first three years the nonprofit distributed $44 million in surplus goods to qualified organizations, including 80,000 vacuum cleaners that were put to use in after-school programs and senior centers. In April 2011, Gifts In Kind became Good360 and continues to distribute a variety of donated goods to many diverse groups, including job-training programs, homeless shelters, hospitals, churches, schools in need of technological equipment, foster care agencies, organizations that help communities rebuild after disasters, YMCAs, Head Start groups and Boys & Girls clubs. Ranked by Forbes magazine as one of the top 10 best-managed charities, Good360 has distributed more than $7 billion worth of goods since the network began almost three decades ago.